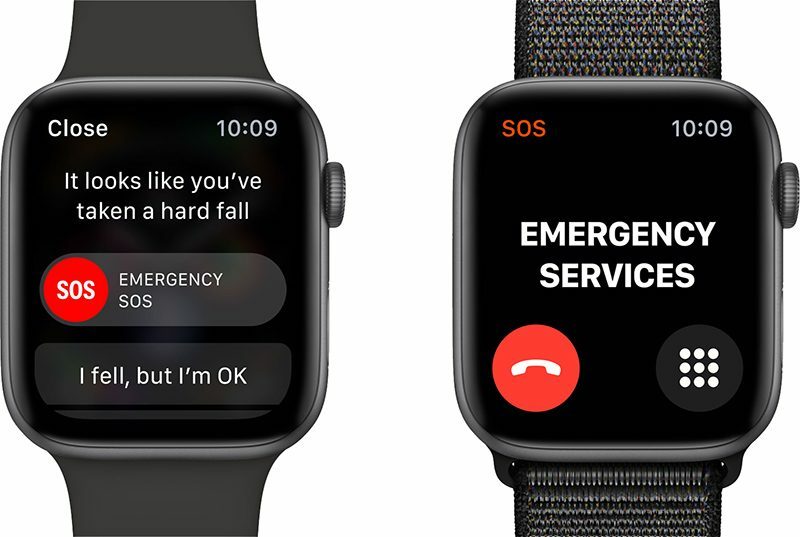 Apple Watch Series 4 has a new feature called Fall Detection, which uses the new next-generation gyroscope and accelerometer to detect a fall and provide options to contact emergency services if necessary. As it turns out, Fall Detection is disabled for most users and will need to be manually enabled. In an Apple support document found by a Reddit user, Apple explains that Fall Detection only turns on automatically if you've set your age on Apple Watch or in the Health app and you're over 65 years old. If you are not over age 65 and want to use Fall Detection, it will need to be enabled in the Emergency SOS section of the Apple Watch app. Apple's support document also explains other aspects of the Fall Detection feature. When the Apple Watch Series 4 detects a "significant, hard fall" with Fall Detection enabled, it taps you on the wrist, sounds an alarm, and displays an alert. From the options that display on the screen, you can select either "I fell but I'm OK," "I did not fall," or "Emergency SOS" to contact emergency services. If the Apple Watch detects that you're moving, it will wait for a response, but if you're immobile for about a minute, it will begin a 15-second countdown before automatically calling emergency services and alerting emergency contacts that are set up in Medical ID in the Health app on iPhone. Fall Detection in the Series 4 was tested over the weekend by multiple YouTube channels to see how the feature works and how hard of a fall is necessary to cause an alert. Test falls onto softer surfaces like foam or carpet didn't seem to trigger the Fall Detection feature, but harder falls onto less forgiving surfaces did appear to work better. YouTube testers were not able to get the feature to trigger with each and every fall, suggesting there's some margin of error, which users should be aware of. Apple says it gathered data from thousands of people over a period of time to create the Fall Detection algorithms, which are able to test both forward facing falls with wrists out and backward facing slips with wrists up. Apple does warn in its support document that the Apple Watch Series 4 won't detect all falls, and also says that false positives are possible. "The more physically active you are, the more likely you are to trigger fall detection due to high impact activity that can appear to be a fall," reads the document. Given the possibility of false positives for active adults, most people will likely want to leave this feature disabled, but it's a good idea to know how to turn it on if you may need it. Does it though? It's a heavily advertised feature. Being disabled by default doesn't appear to be obvious or clear. But most importantly, people of any age can fall and take advantage of this. If the algorithm is good enough and hard enough to fake, I don't see the disadvantage for always being on. I’ll keep it on on mine even though I’m nowhere near 65 years old. I know false positives are possible but if I can’t deactivate it before it calls 911 then I’d probably need it. My dad was prone to falling — especially in the last three or four years of his life. He passed away earlier this year, but if he was still living, I would’ve bought a Series 4 for him in a heartbeat specifically for the fall detection feature. He never used one of those “help line” bracelets (even though he should have); but he was kind of a gadget guy and I think he would’ve liked this latest Apple Watch — particularly with the larger display. I bought a Series 4 for myself a few days ago and I turned the fall detection feature on. It’s one of those “I hope I don’t need to use it, but it’s nice to know it’s there” features. You mean like being on a rollercoaster? I would think these algorithms are extremely specific, and I doubt any (or at least the vast majority of) rollercoaster has the matching characteristics of a trip/slip fall. I’ll keep it on on mine even though I’m nowhere near 65 years old. Same. I'm a cyclist and hope these algorithms detect falling (or being thrown) off.
" Again, Apple’s health claims are not that the Watch will detect these falls, but simply that it could." The verge could not reproduce a fall, that's all they said. A fall is 180G from .9m and 380g from 1m80 on concrete. Over 100G's on wood over concrete. They're not doing it for good reason; they don't want to injure themselves. Reproducing this or something less severe will damage even a healthy individual. They're not testing and actual event UNLIKE APPLE whose claims must actually stand muster long term cause people will actually depend on their device. They and the independent said Apple had a sampling of ACTUAL PEOPLE IN ASSISTED LIVING and with MOVEMENT DISORDERS (2500 which is a hell of a lot of people to monitor). That's the whole point of the argument. They HAVE ACTUAL DATA of ACTUAL FALLS. Unlike those bozos on YOUTUBE and YOU. You are the epitome of desingenousness; you truly don't give a crap if you have a point, you'll pound it till it bleeds anyway. I'm 50, and a cardiac patient. The fall detection is one of several big motivators for buying this (ok, I wore my Series 0 to complete destruction a few weeks ago). Were my pacemaker or mechanical valve to catastrophically fail (unlikely but possible), I very well could go from feeling normal to unconscious in seconds - in a condition where minutes may matter, and a 911 smart-auto-dial could make the difference. Yeah, it might not work - but it might, and as the odds of the scenario increase, so will the quality of fall detection software. The ECG may prove useful. Yes it's merely one channel - and that's way better than zero channels. I've had numerous moments of "something feels odd, would be nice to record ECG right now." Recording something on the fly can let me eyeball the graph, and email a "hey, look at this" to the cardiologist without having to schedule expensive visits resulting in "well, you look fine now." Would have been VERY helpful when atrial flutter kicked in (heart wanted to run 350 BPM, pacer slammed on the brakes at 150 for 12 hours before walking (!) into the ER saying "something's wrong"); a visual, seeing an atypical pattern, would have been far more persuasive than "dang, heart is running fast". Yeah, I'm younger than those who normally would have an active interest in such features. With a large market, there's a non-trivial number of us. Yeah, it's expensive. So is a nice analog watch. While many are pinching pennies, many have saved well and can afford a feature-full watch. Nobody is "betting the farm" on this. That's a ridiculous strawman. This is, however, a huge step into the future. Many of us will gladly pay a modest (!) price to move the state-of-the-art into new realms. $530 for a base ECG-and-falls-and-cellphone capable model really isn't that much more than a nice watch + FitBit. My mother is considering buying these for her parents because of this feature.